Introduce packaging vocabulary to students and ask random questions: How is milk packed? How are crisps packed? How is orange juice packed? Answers can be: Orange juice can be in a jug, a box, a bottle or in a can. You can discuss with students what packaging they prefer when buying orange juice. 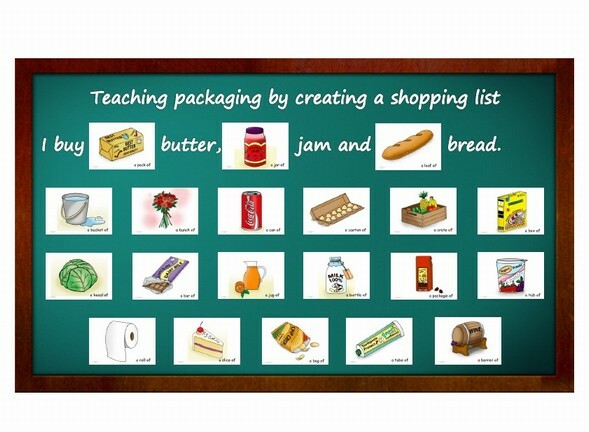 Also you can create shopping lists giving students several items, such as soap, water, pizza, sweets e.g.. Students have to create a shopping list for the specified items using packaging vocabulary. This activity can be done in small groups as well as pair work. Packaging and Containers – Pick a student to start. That student can say any packaging vocabulary. Other students have to write items down, what get packed in that packaging form, for example “a bar of”. Students have to write down sentences such as, a bar of chocolate, a bar of gold e.g.. Student with the most items is the next one to call out a vocabulary.